A MODERN TWO DOUBLE BEDROOM / TWO BATHROOM FIRST FLOOR APARTMENT WITH PARKING... Conveniently situated for quick access to Manchester Airport, Wythenshawe Hospital and motorway links. Briefly comprising; Entrance hallway. Large open plan lounge with dining area. Fully fitted kitchen with a range of appliances: Fridge/freezer, oven/hob and washer/dryer and wall and base units. 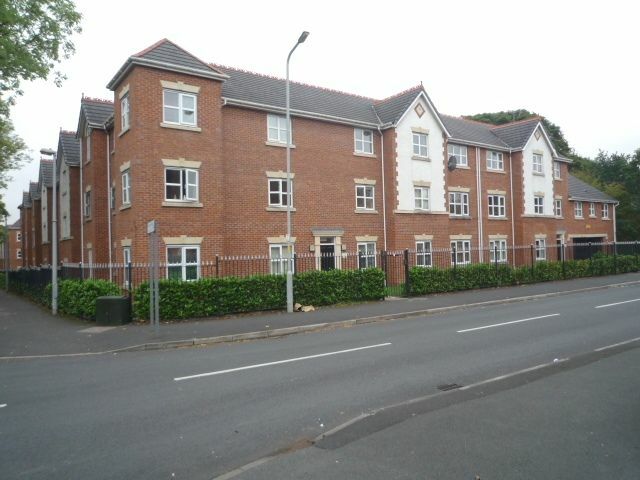 Spacious Master double bedroom with En Suite Shower Room .Second double bedroom. Family bathroom . GCH. Residents parking. Wooden door into a carpeted Lounge/Dining Room with UPVC Double Glazed window to front and wall mounted radiator, power points and centre wall light fitting. Wooden door to Lounge/Dining Room Kitchen which is open plan. UPVC Double Glazed Window , Stainless Steel Sink, A Range of wall and base units, Integrated Washing machine, Gas Hob and Electric oven with Stainless Steel Extractor fan, Integrated boiler, fridge freezer. Vinyl Flooring and spotlights to ceiling. Wooden door off hallway to main bathroom which comprises Bath, sink, wc, heated towel rail, UPVC Double Glazed window, Part Tiled walls, Extractor Fan and Spotlights to ceiling and vinyl flooring. Storage Cupboard with wooden door with a shelf. 15'01" (4m 59cm) x 11'8"
Wooden door into a double carpeted bedroom with UPVC Double Glazed window, radiator and centre light fitting with power points. Wooden door to storage room off hallway which comprises Fuse Box.